The actor Nakamura Tsuruzô II held this name from the 2nd lunar month of 1867 to April 1890. Born the 15th of October 1884. First son of the rakugo storyteller Katsura Eiga. He started his career as a disciple of the zamoto Nakamura Kanzaburô XIII. 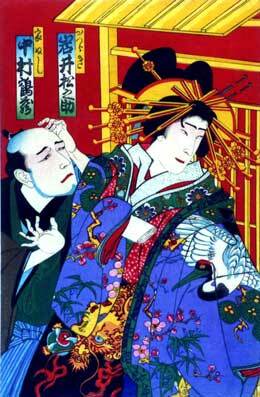 He made his debut on stage in March 1896 at the Meijiza, where he received the name of Nakamura Kamematsu I. 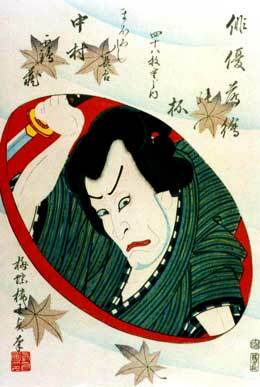 He became a disciple of Ichikawa Ennosuke I and received the name of Ichikawa Kimizô in July 1897. He took the name of Nakamura Tsuruzô III at the Meijiza in May 1911, playing two roles in the drama "Imoseyama Onna Teikin". 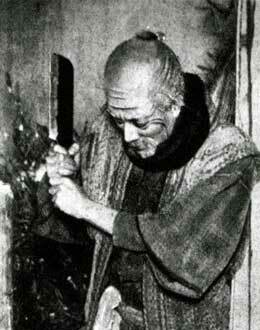 This supporting katakiyaku actor died the 2nd of July 1932. He was the elder brother of Nakamura Tsuruzô IV. 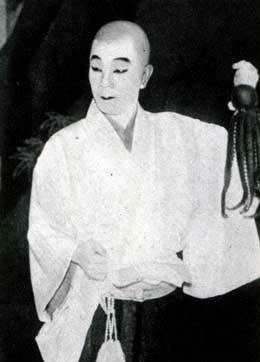 Nakamura Tsuruzô III playing the role of the boatman Jinbei in the drama "Sakura Giminden"
Born in 1899. Second son of the rakugo storyteller Katsura Eiga. He made his debut in May 1911 at the Meijiza, where he received the name of Nakamura Kamematsu II (while his brother took the name of Nakamura Tsuruzô III). He took part in the founding of the Zenshinza troupe, alongside with Kawarasaki Chôjûrô IV and Nakamura Kan'emon III. He finally took the name of Nakamura Tsuruzô IV in November 1933. He died the 7th of December 1945, before the end of his 40s just like his elder brother. 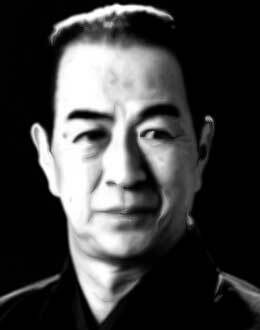 He was the father of Nakamura Tsuruzô V.
Nakamura Tsuruzô IV playing the role of the bonze Hakuunbô in the drama "Narukami"
Born in Tôkyô the 17th of April 1925. Son of Nakamura Tsuruzô IV, he made his debut in March 1932 at the Ichimuraza, where he received the name of Nakamura Tsurumatsu I and played the role of Omatsu in the drama "Sanzesô Nishiki Bunshô". He joined the Zenshinza troupe in March 1943, took the name of Nakamura Kimizô in February 1944 and was acknowledged as an official and regular member of the troupe in April 1945. He finally took the name of Nakamura Tsuruzô V in February 1954. His best roles are Kanpera Monbei ("Sukeroku"), Rôen ("Gojû no Tô"), Tanzaemon ("Shunkan"), Rokubei ("Gonza to Sukejû") and Iemon ("Yotsuya Kaidan").